At Beauty High we constantly have new products crossing our desks and are always on the hunt for the next best thing. “The One Thing” is our way of sharing with you that must-have product that you need to introduce to your lives right now, even if it means skipping Starbucks for a couple of days. It’s just about every girl’s dream to have long, voluminous eyelashes, but considering most of us weren’t born with the lashes of a Kardashian, we’ve got to invest some work into getting there. Between finding a good mascara that works for your eyes and knowing how to properly apply false lashes, there’s a lot of work that goes into looking wide-eyed. But, when false lashes aren’t on the table (i.e. every day life), a good lash curler is in order. Mechanical eyelash curlers are great and all, but from the first time we were introduced to this lash curler by makeup artist Lindsey Williams, we were hooked. Because it’s clamp-less, it won’t crush lashes when you curl them. Simply place the heated wand under your lashes just about against your lid, hold for 10 to 20 seconds and voilà! Gigantic lashes that hold for hours. Battery operated, the wand heats up in about 20 seconds and you’re ready to curl. 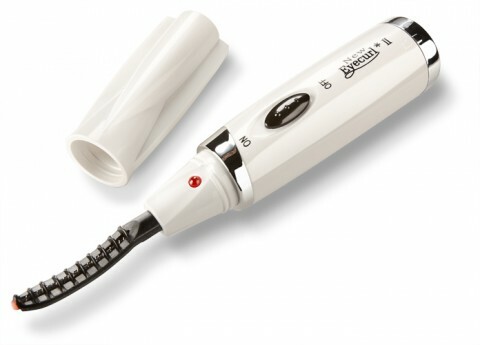 It’s specifically designed to be used after mascara, instead of beforehand like a mechanical curler, so the mascara holds the curl in place once you’re done using the wand. It travels easily, lasts for years (literally – just take the battery out when you’re not using it to conserve the life of the product), and delivers some seriously curled lashes, making your job a little bit easier when it comes to getting full eyes.